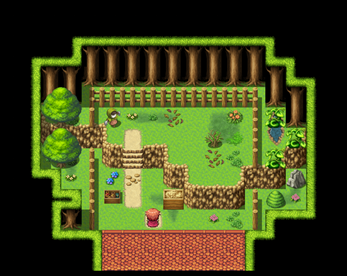 "Harold Grows A Tree" is a short game based on the 1 Map Challenge on RPG Maker Web Forums! This project was made in RPG Maker MV and completed in one day. Also SmashArtist's first ever completed game! Hooray!! Pretty short and dumb game, don't take it seriously. Harold buys a new house and the backyard is a wreck! He explores and finds a lonely sad bush, it's up to him to help nurse it back to health! Nice little 1 map challenge. The scarecrow is awesome. Somehow though I managed to make the game freeze by spamming the scarecrow while the tree was growing. What with the face at the end tho? Kinda creepy.